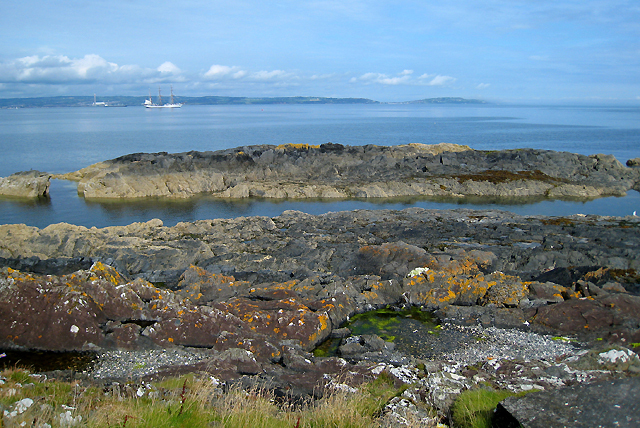 The 'Mackerel Rocks', as the name suggests, are one of the best places to fish for mackerel in the Bangor area. Popular with sea anglers they have become rather infamous as, exposed above water close to low tide only, several people have recently become stranded by the rising water when the tide changes, necessitating a rescue by lifeboat. Hence the new warning signs in the area such as J5082 : Warning sign, Bangor. The sailing ship at anchor in Belfast Lough beyond is the 'Sagres' J3982 : 'Sagres' in Belfast Lough - Tall Ships Belfast 2009 which had arrived for the Tall Ships Belfast 2009 festival.